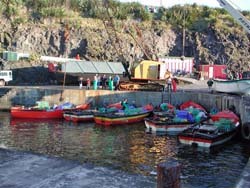 News of commercial and domestic fishing in the waters of the Tristan da Cunha archipelago during the 2005-2006 and 2007-2008 fishing seasons. Last month ended with a flourish with five consecutive days up to 29th November, and December started well with 10 tonnes landed on Monday 3rd and Tuesday 4th December. This left everybody very tired but also happy to make such an impressive dent in the quota. There is only 36.5 tonnes left of the agreed quota, and Erik hopes to catch this early in the new year. Fishing and production went very well and a visit from Ovenstone managers was well timed as it enabled them to see the factory and fishing in full swing. Erik has now decided to stop fishing for the year, as it makes no sense to have stock in the freezers over the hottest time of the year. MV Edinburgh will take the last of our production on Monday 10th or Tuesday 11th December and will be back in Cape Town early enough to get the stock safely transferred into cold storage. Erik is also aware that with the sickness on the Island, people affected can rest at home without fishing or production pressures tempting an early return to work. Erik and his staff are now looking forward to break-up day on Friday 14th December and the very welcome three week mid summer Christmas and New Year holiday that follows. Pictured right at the helm of powerboat 'Boissevain', returning to Calshot Harbour on 17th August 2007 is Andrew Green, accompanied by crew members Barry Swain and apprentice Nicole Glass. Nicole is the first female apprentice employed by the Factory to go fishing. tristandc.com's manager will have to try to think of an appropriate name in the future to replace fisherman/woman with something less clumsy than fisherperson - any ideas? 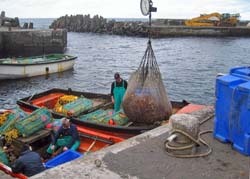 Larry and Chris Swain watch closely as their catch of valuable Tristan Rock Lobster is unloaded ready for weighing on the fifth fishing day of the season on 17th August 2007. Report and pictures of August fishing from Tristan Administrator Mike Hentley. After a blank July due to poor winter weather, August started well with fishing days on 1st, 2nd, 9th, 13th and 17th. This picture shows Noelene Swain weighing in Larry and Chris Swain's catch on 17th August at 1000 lbs of crawfish or Tristan Rock Lobster. Still no sight of a first fishing day as the island approaches the end of July. Strong winds continue to prevent using the harbour on Saturday 28th July, and it will take a dramatic change in conditions to avoid waiting until August for a first Tristan fishing day. 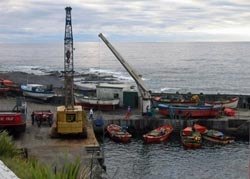 The 2007 Tristan da Cunha crawfishing season officially started on 1st July, but winter weather conditions have delayed the first fishing day so far. Factory Manager Erik MacKenzie returned (with Claire and young Caitlin) aboard MV Edinburgh on Friday 30th June, to co-ordinate the fishing season's operations. The factory workforce is now eagerly awaiting the first fishing day since the final part of the 2006 quota was caught on Wednesday 13th December, since when the fishing grounds have been rested. The quota system has been so successful that experts have now raised earlier quotas based on increasing stocks, as the Tristan fishing industry provides a model for less well managed and deteriorating fishing grounds worldwide. MV Edinburgh is scheduled to depart from Cape Town on 14th August and arrive at Tristan on 20th August on the first of two planned extended fishing voyages around the outer islands (Nightingale, Inaccessible and Gough), aiming to return from Tristan on 9th October. 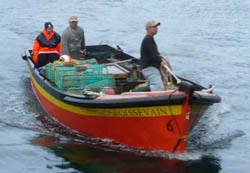 Preparations for the start of the 2007 Fishing Season on Tristan included the manufacture by the Tristan Factory team of a replacement fishing boat to be used by local fishermen for the 'crawfish' (rock lobster) catch taken in the waters around Tristan main Island. In a ceremony on 10 July, resident anglican rector Father Chris Brown blessed the latest addition to the local fleet which was then named by Admin's wife Janice Hentley with the traditional breaking of a bottle of champagne. The boat's name 'Shearwater' was chosen from a selection submitted by members of the community, (and co-incidentally the seabird features on an issue of Tristan stamps this year). Although the fishing season officially started on 1 July, the local 'dong' ringers continue to wait for a break from the current spell of stormy weather in order to signal the first fishing day of the season. 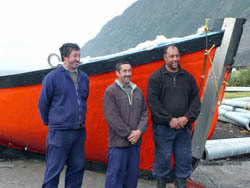 Photo by Janice Hentley shows three of the four fishermen who will take the boat to sea on alternate fishing days: brothers Alfred and Patrick Rogers, and Raymond Green (whose fishing partner Eddie Rogers is currently away in Cape Town). The Fisheries Patrol Vessel Wave Dancer was launched early in the afternoon of 31st March 2007 after a fishing boat sighted off Tristan failed to respond to VHF or HF calls from Andrea Repetto of Tristan Radio. 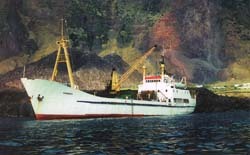 Cox Joe Green and his crew approached the suspect fishing boat, rigged for longline and squid fishing, in the waters between Tristan and Inaccessible Islands and put Sea Fisheries Officers James Glass and Warren Green aboard to inspect the vessel's papers and check that fishing gear was stowed and refrigerated holds empty. On satisfactory completion of the inspection, the vessel - identified as the Chinese registered Chi Jing 3 - was allowed to proceed to its declared destination port in Argentina. Only licensed vessels are authorised to fish in Tristan waters. Unlicensed vessels deprive the Island of earnings from licence sales and catch royalties (some 90% of Tristan's external revenue is from the fisheries sector). It is also important that fishing is regulated with catch quotas set to avoid overfishing, and with environmental conservation measures in place to protect sea birds which might be caught in the lines and nets. The Tristan Government, with support from it's long term crawfish concession partner, will continue to do whatever it can to protect it's waters from illegal, unregulated and unreported fishing activities. Close working relationships have been established with the South African Marine & Coastal Management authorities in Cape Town. Vessels landing crawfish there suspected of being taken from Tristan waters risk having the catch subjected to genetic testing to establish origin. Report from Administrator Mike Hentley and photographs of the Wave Dancer returning to Calshot Harbour from Thierry Assef. Mark Swain is one of a group of islanders who have been working with the Titan team to remove the stricken oil platform marooned on Trypot Reef. This picture (taken by Brian Godfrey kindly sent by Cynthia Green) shows Mark with a cape mackerel he caught on 20th January while doing a spot of fishing aboard MV Kelso, which remains on charter to Titan to support their work. Not used to an idle life, islanders will relish living on the Kelso and being able to catch some more fish after the commercial crawfishing season has finished. See also our news page on the stricken oil platform. Early on the morning of Wednesday 13th December, the 'dong' rang for the 32nd and final day of Tristan's 06/07 Fishing Season which began in July. This season got off to a very good start with a fortunate combination of suitable weather early in the season and good catches, and the trend continued thus enabling the quota to be completed before the Christmas Break Up period begins on 15 December. Captain Clarence October and his crew aboard the Edinburgh have also had a good season, with the catch quotas for Gough and Nightingale Islands already completed, and only 14% of the Inaccessible quota remaining. 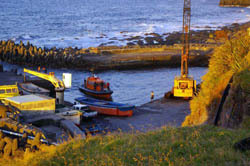 With the Kelso currently being chartered to support the salvage of the oil rig stranded at Trypot Bay, plans are for the Edinburgh crew now to return to Cape Town for a well-earned Christmas break, and to replace the Kelso on the scheduled January cargo/passenger sailing when the remaining Inaccessible quota will also be fished. Factory Manager Erik MacKenzie handing over to Medical Officer Joerg Jaschinski & Administrator Mike Hentley their pay checks for their work experience day in the Fish Factory. 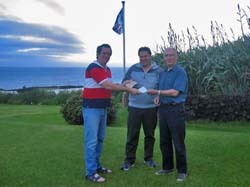 (Both donated their earnings to the Island's Disaster Fund).See story below. Factory Manager Erik MacKenzie challenged Tristan da Cunha Administrator Mike Hentley and Medical Officer Dr Joerg Jaschinski to help out at the factory on the first available Saturday processing Tristan Rock Lobster or Crawfish. So, on Saturday 21st October at 6.30am Mike, followed at 8am by Joerg dutifully turned up and clocked in to work on Day 20 of the 2006/7 fishing season. Erik reports that trainee Mike only had two tea breaks but no lunch break in his 13 hour shift which finished at 7.30pm, but that Joerg was called away late in the afternoon to do a post-mortem on a calf! 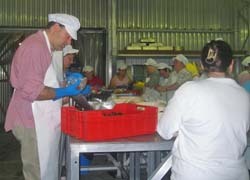 The day's catch was excellent, with a record amount of whole raw frozen fish processed. Mike was impressed with the range of people who turned up for work from 15 year olds to pensioners. But not so impressed with a sore back on Sunday morning! Bottom: Joerg working with the packing ladies. Tristan fisherman Donald Hagan was 70 on 29th September and decided that it was time to hang up his crawfish pots and start to enjoy his retirement. Not that Donald will stop tending his stock or Potato Patches! With typical dedication to duty, Donald postponed his birthday celebrations until Sunday 30th when his wife Joyce had a party ready, just in case his actual birthday was a fishing day! So Donald went out soon after dawn as usual on his 70th birthday, and he and his partner landed over 1000lbs of prime Tristan Rock lobster in Calshot Harbour that evening. The Tristan da Cunha community salute Donald's achievement and wish him a long and happy retirement (at least from fishing)! Happy Birthday Donald! 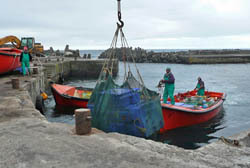 Friday 11th August was the first fishing day since 20th July due to poor weather conditions. The fleet had to lift their nets early as the weather was picking up, and got back to the harbour around 16.30, so no record catches, but at least they got out. Nevertheless, 20% of the Tristan quota has been caught since 1st July, well up on this time last year. The Edinburgh is due on 19th August to start a scheduled 40 day fishing trip around the outer islands of Nightingale, Inaccessible and Gough Islands. The 2006/7 crawfishing season got underway on Uncle Sam's Birthday when the Tristan based power boats went out on the first good July day. 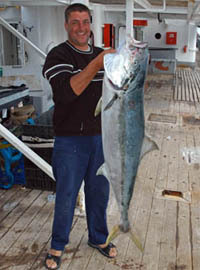 Wednesday 5th July was also a successful fishing day with quality and quantity both reported as good. The photograph shows the boats safely back in Calshot Harbour with their first day catch. (see Shipping Schedule and Details of Ships). Fishing day 38 was Wednesday 22nd March and proved to be the final day of the 2005/06 season as the last of the remaining quota for Tristan was landed. 38 days between 1st July 2005 - 23rd March 2006 give an indication that safe conditions for fishing are not common in this exposed location. After processing and freezing, the product will be loaded aboard the MFV Edinburgh due to arrive on Tristan at the end of the month for despatch via South Africa to the export markets. Factory Manager Erik McKenzie will also be departing on well-earned leave then, while Deputy Manager Alan Swain and his team implement the end-of-season maintenance programme to prepare the Factory and the fishing boats for the start of the next season in July. 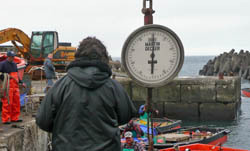 March 21st 2006 saw the Autumnal Equinox on Tristan, and it may have marked the last day of the 2005/6 crawfishing season, but there is one tonne to be caught of the agreed quota on what is likely to be the last day's fishing until next July when a new season will begin. This afternoon shot from Mike Hentley shows the fish being unloaded in Calshot Harbour before being driven to the cliff top factory for processing. 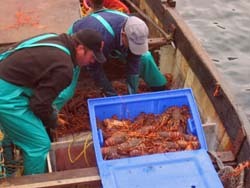 Manager Erik MacKenzie was pleased to announce on 30 September a satisfactory solution to the pay dispute which has affected production at the Tristan Lobster Factory for the past 3 weeks. 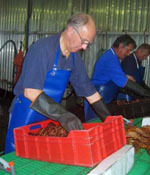 Traditionally, this work has been on piece-rate terms, with workers packing the basic product of lobster tails being paid per box. To meet a growing market demand for whole lobster (cooked or raw), the company have introduced a wages structure which guarantees a minimum hourly rate of pay, with the opportunity to earn additional bonus money for extra output of these products. Casual workers, who help process the catch on fishing days during the season, have accepted an offer which will increase earnings for packing whole lobster by 5.2% and lobster tails by 12.9%. Erik MacKenzie, newly-appointed Factory Manager who arrived on Tristan in August for the start of the 05/06 fishing season, got off to a good start when he successfully concluded long-standing negotiations with the factory's permanent employees for a revised pay structure. Although lobster is a premium product which commands high prices when served to the consumer in four star restaurants, the world market price is set at very competitive levels and - like barrels of oil - fixed in US Dollars. With the weak dollar exchange rate, producers work within tight margins, particularly when dealing with the expensive logistics of delivering the jasus tristani Tristan catch to traditional markets in the USA and Japan. Given this background, Erik's pay deal, resulting in wage increases of some 3%, therefore was a win-win result for both employer and employees.